The Four Graces are the daughters of the Reverend Grace, a country vicar in an English village. Mr Grace is a widower and his four grown up daughters are ‘doing their bit’ for the war effort; the story takes place in a year during World War 2. First published in March 1946 but obviously written when war was still ongoing, in the Far East anyway, it’s a deliberately light-hearted tale of family life and sisters in particular. D.E.Stevenson didn’t want to write about the depressions of Total War, she wrote about the inconveniences of war and of course that perennial problem of rationing. Adeline, the youngest sister, doesn’t really feature much as a character as she is in London most of the time, in one of the services. But she manages to foist a most ghastly person on the family. Aunt Rona (by marriage) has been bombed out of her home in London and Addie tells Rona that she will be made welcome at the vicarage. Well most sisters would have been up in arms at that because Rona makes life at the vicarage very uncomfortable, especially as she has obviously decided to become the next Mrs Grace. But it does give D.E. plenty of opportunity to have some fun at her expense. The book is light entertainment but it does flag up actual situations which people found themselves in in wartime. Such as the woman who had grown to love her wee evacuee as if he were her son. When his mother decides that as London is no longer in danger from Hitler’s bombs she writes asking for her son to be sent back to his family home. But the boy was never cherished at home and she just wants him there as he is now old enough to be of use to her. The evacuee’s surrogate mother is desperate to hold on to him and give him a good start in life, something he won’t get in his biological home. This was a situation which did happen and I know one man who was heart-broken to have to go back to the city and leave his country home and family when hostilities stopped. He kept up contact with them all their lives though. So, this is a good comfort read, but is true to life as it was at that time. 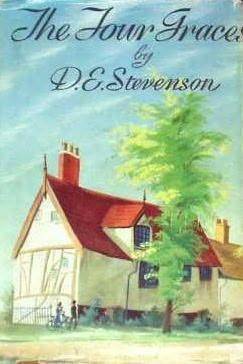 Stevenson was of course Scottish, indeed a relative of Robert Louis Stevenson, and I read this one for the Read Scotland Challenge. I think that’s my ninth one. This entry was posted in Books and tagged comfort read, D E Stevenson, The Four Graces, World War 2 fiction by Katrina. Bookmark the permalink. Just wondering if this is a library book or a used bookshop find. Also, if it’s not too much trouble, do you know in what year it was first published? It was a charity (thrift) shop find. They usually have mainly modern paperbacks but you can sometimes be lucky and find more obscure books. March 1946–that’s so interesting. Sorry. Presumably it was actually written in 1945 when the war was still in full swing, there’s nothing in the book to make you think that the war is nearing its end though, apart from not so many bombs falling on London.